After acclaimed performances at Lincoln Center and The Town Hall, in 2013, Bibi Ferreira is back in New York City next week (September 20 and 23) with a new concert, “4XBIBI”. 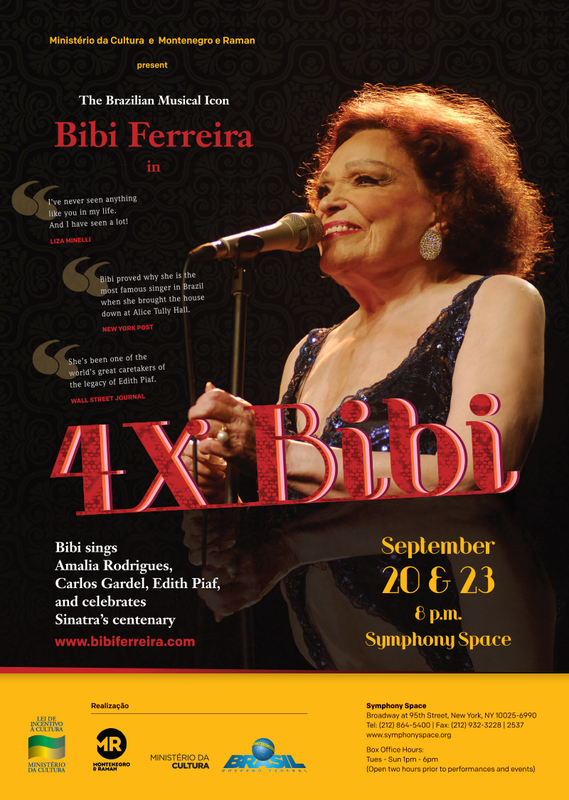 The show celebrates Bibi’s 75-year career with her signature repertoire: Amalia Rodrigues, Carlos Gardel, Edith Piaf and Frank Sinatra. Bibi Ferreira, the Grand Dame of Brazil’s stages, is an artist of many talents. Throughout her life, besides singing, she has performed, directed and produced some important moments in 20th century Brazilian theater. A hallmark is the musical “Piaf – A Life of a Song Star”. Premiering in 1983, this musical about French singer Edith Piaf ran for 28 years and received the Ordre des Arts et des Lettres, prize awarded by the French government. Bibi also lived the life and the music of Portuguese singer Amália Rodrigues on stage, in “Bibi Vive Amália”, not to mention her deep admiration for Carlos Gardel and Frank Sinatra. They will all be honored in this concert.